Missing man found, alleges assault and harassment by congress workers. Kundapur: June 16, 2015: The case of Missing man has taken an interesting turn as he now alleges that he was harrased by the congress workers. Ravi is a well known person in Anagali who runs a general store went missing from his shop on Monday June 15. Ravi had supported the BJP candidate in this Gram Panchayat election. Soon after the results were declared, the congress workers assaulted and tortured Ravi, unable to bear the torture Ravi got disappeared suddenly on Monday. Ravi could not be traced, he was missing for the whole day. The news spread like a wild fire. But on the same night, some people spotted Ravi near Anagali Bridge and brought him from there and took him to his house. When his relatives asked him about his missing, he revealed that he was assaulted by the congress workers and could not handle the torture and went to Kodi beach and sat there. 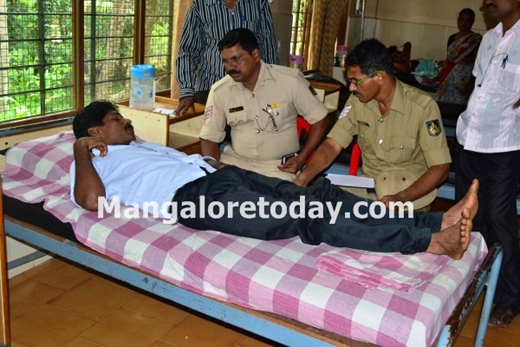 Ravi looked broken, soon his family members admitted him to private hospital in Kundapur for the treatment. Ravi’s family members registered a complaint at the Kundapur police station stating that he was assaulted and abused by the congress workers. The family members have also mentioned two names of two congress workers Suresh Kanchan and Sharath Kanchan. According to the sources, Ravi was a congress supporter who backed BJP in this gram panchayat election. Reacting to the incident, the Angali gram panchayat Congress president Suresh Nayak said “the incident looks more like a sham, nobody kidnapped Ravi and he is trying to make up a story. I have been in politics since 15 years.This time we lost, but we have no connection with this scenario"